Ashes 2015. Pessimism Loses as England Beat Australia by 169 at Cardiff. Eighteen years of regular humiliation for England at the hands of their Australian cricketing rivals inculcates a particular brand of pessimism in the fans. A five nil drubbing down under last time out, allied to a dreadful World Cup and inconsistent performances against the W. Indies and New Zealand led me to predict a three nil Ashes defeat to Mr. Tait. Then I ran into the father of an old mate in Town as the afternoon session yesterday was just underway with the tourists needing an unlikely 432 to win on a deteriorating Cardiff track. I suggested that if the target was to be reached this batting line up of Warner, Smith and Clarke, aided by the hard hitting Johnson and the durable Haddin could well do it. Mr. Walsh did not demur. The genial Irishman was in fact my class teacher when I was in the equivalent of Year 8 at St. John Fisher on Orchard Park. The Mayo man loves his sport and has a keen interest in cricket. July 1981 saw English cities burn and Mr. Walsh wrote the number 3 million on the board, asking us what figure Thatcher would let unemployment reach before stepping in. But just as memorably on Tuesday 21st of that month he dispatched Mike Nolan and me to watch the schools one and only TV. Our “task” was to watch the final day’s play of the Ashes Test at Leeds. Our instructions were to relay to him the fall of wickets. 8-43 from veteran paceman Bob Willis ensured a well worn path was established. England won having followed on. The bookies were offering 500-1 when Ian Botham came to the wicket. 149 runs later the shell shocked Aussies were blown away falling 18 runs short of a paltry 130 target. In these days of targets and minute by minute monitoring of lessons such a thing would never happen. Incidentally on the day of Marshall Tito’s death Mr. Walsh correctly predicted the chaos that would engulf Yugoslavia in the following years. England produced an almost flawless display of test cricket over the four days it took to best the Aussies in the Welsh sunshine. 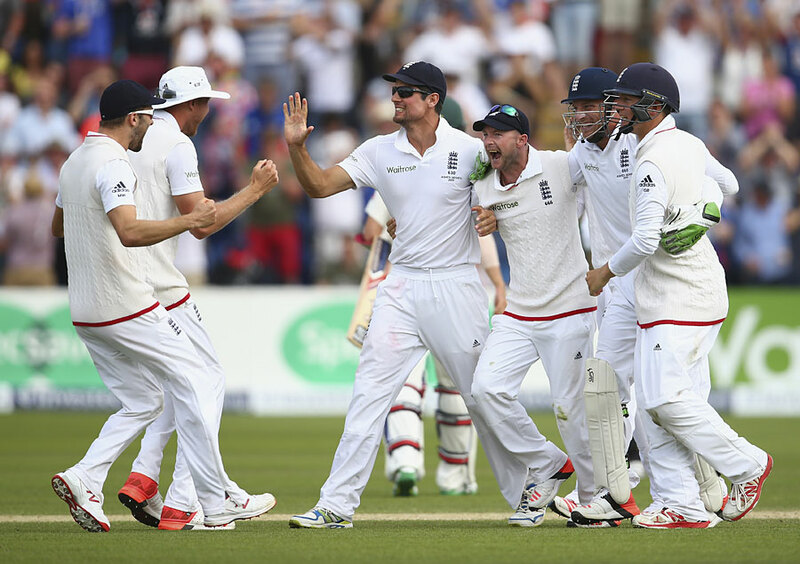 They play a brand of forceful and attacking cricket and for once Cook was not afraid. Moen was introduced just before lunch and was thrashed for 22 in a couple of over including a huge six from Warner. Nevertheless the skipper kept the faith and the Worcester all rounder got rid of the dangerous Warner as well as Haddin and the final victim Josh Hazelwood. These wickets followed from his dismissals of Clarke and Smith in the first innings. Moen also smacked a vital 77 in England’s first knock to marshal the tail and post 430. A great all round effort. Moen, along with one or two others should not fit. But he does which is testament to the instincts of assistant coach Paul Farbrace and captain Alastair Cook. Gary Ballance is another played who defies the odds. He bats down the order for Yorkshire and is an expert at dismantling a tiring county attack with vicious pulls and cuts added to strong hitting down the ground. Number three is a totally different role. Given Cook’s travails and Lyth’s inexperience Ballance is often called to the wicket when the ball is still hard, the seam proud and the bowlers in good fettle. Nevertheless the Zimbabwean born Yorkshireman has shown supreme calmness in pressure situations compiling over 1100 runs in just 14 Tests at an average of 50.30 with 4 hundreds. Having suffered technical glitches in the New Zealand series Ballance had to battle for ugly runs. When Ian Bell departed and Joe Root came to the crease in the very first session England were rocking at 43/3. Balance got his head down, eking out 61 priceless runs as Joe Root dismantled the bowling from the other end. They were parted with the score on 196 leaving a platform for Stokes and Moen to post an above par total of 430. Broad and Anderson looked weary in the Caribbean and suffered at the hands of the Kiwis in the Leeds Test last month. Given the debacle down under 18 months ago maybe their race has been run. Both steamed in swinging and cutting the ball at will leading an inexperienced attack to a comfortable victory. Back to back Tests may prove to be problematic in the long run. Mark Wood looks a fine cricketer. He appears to have a phlegmatic character and can send the ball down at 90mph on a regular basis. He mixes up the angles and can produce reverse swing. His action however is explosive a la Simon Jones so let’s hope he is luckier in the injury stakes. Lyth batted well in the second innings and once again Ian Bell produced when it absolutely mattered. Ben Stokes was Mr. Consistency and Jos Buttler steady with the bat and gloves. There is no cause to get carried away however. Cook’s batting is still a worry and despite evidence to the contrary Moen Ali is no Test spinner in my book. But hell, we are one nil up in an Ashes series so now is not the time to be churlish. This is a young team and will suffer setbacks, but overall the future is bright especially when Jonny Bairstow, Adil Rashid and Chris Woakes can’t even get a game. Writer and co author "Through Red Lenses". Activist Unite the Union, Save Our NHS Hull. Fan of Yorkshire County Cricket Club, Hull FC, Munster and Ireland Rugby. Views are mine alone and may not reflect the organisations concerned.